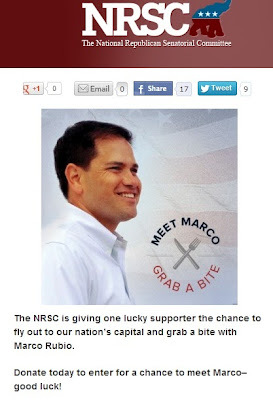 Conservatives see him as a sell-out on immigration, someone who betrayed the values and viewpoints of those who supported his rise to power, but the National Republican Senate Committee seems to see Marco Rubio as its fundraising superstar. Just another example how the Republicans in DC are out of step with the party's base. Or should I say, the party's former base? Has America's "gun fever" finally broken? "Every time you pick up the phone"
"Putting his cart before the hearse"
Big Brother in a panic?